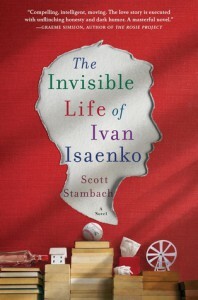 The Invisible Life of Ivan Isaenko makes your eyes well up with tears one moment and shake with uncontrolled laughter the next moment. This is a unique take on a cancer love story that is more compelling. "I need to share this place with you, Reader. I need to share my friends who I would never admit were my friends. I need to share my beloved with you, who I would never admit I loved. For if I don't document our world right now, on this ambiguously stained paper, with my fading pen, in my delirious left-handed penmanship, we will risk fading into the foam of history without mention. Reader, I hope after this you understand that we are entitled to more than that." Seventeen-year-old Ivan Isaenko is a life-long resident of the Mazyr Hospital for Gravely Ill Children in Belarus. Born deformed, yet mentally keen with a frighteningly sharp wit, strong intellect, and a voracious appetite for books. Every day is exactly the same for Ivan, that is until a new resident named Polina arrives at the hospital. At first, Ivan resents Polina. She steals his books. She challenges his routine. But soon, he cannot help being drawn to her and the two forge a romance that is tenuous and beautiful and everything they never dared dream of. Before, he survived by being utterly detached from things and people. Now, Ivan wants something more. I received a free advanced copy of this book from Netgalley through St. Martin's Press in exchange for an honest review.